According to the National Institute on Aging at NIH, exercise and physical activity are good for just about everyone, including older adults. No matter your health and physical abilities, you can gain a lot by staying active. 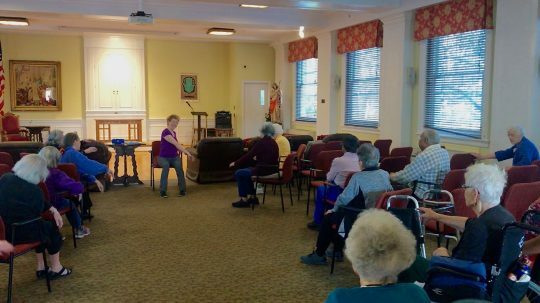 In fact, at Springwell, fitness instructor Meg McNamara teaches a chair exercise class so that residents of all fitness levels can stay healthy and active — her oldest participant is 96 years young! McNamara is celebrating her fourth year teaching at Springwell and says that the chair exercise class is one of the more popular offerings. As many as 17 residents at a time come to get their workout at the 45-minute class, which incorporates stretching, aerobics and abdominal exercises. McNamara likes to mix up the moves and also practices “Qigong,” a Chinese mind-body-spirit practice that improves one’s mental and physical health by integrating posture, movement, breathing technique, self-massage, sound, and focused intent. 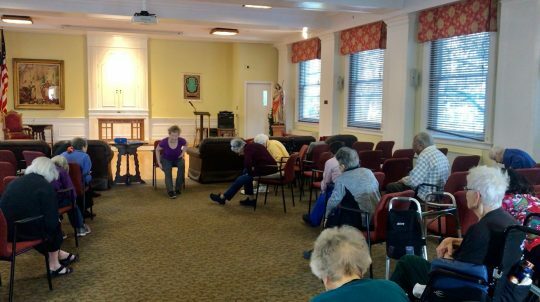 She often incorporates yoga moves into the class, and according to DailyCaring.com, chair yoga is an excellent way for older adults to loosen and stretch painful muscles, reduce stress, and improve circulation. It also reduces anxiety, helps lower blood pressure, protects joints, and builds strength and balance. Staying seated means that even frail seniors or those who aren’t flexible can safely do the exercises. McNamara holds classes in the Springwell building Monday and Wednesday mornings at 10:45 a.m. and in The Homestead building Tuesday and Thursday mornings at 11:00 a.m. Each class is 45 minutes. In addition, Springwell offers exercise classes other days of the week (every day but Sunday) led by instructors from LifeBridge Health & Fitness.